Zestaw 3 kolorów niezbędnych do wykonania imitacji rdzy oraz wycieków paliwa. Doskonały dla modelarzy ambitnie podchodzących do zagadnienia realistycznego malowania modeli. 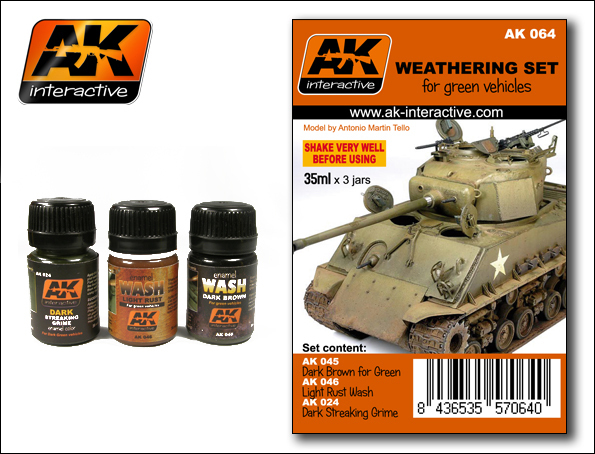 Three products from our weathering range for the lovers of green vehicles. The set includes the colors AK 024, AK 045 y AK046, Great for doing streaking effects, and dark or rust colored washes. The three colors are sold at the same price, separately, but here we have put them together in a set for people who are just starting out in the world of paint effects or just for the ease to have all three colors in one pack.